Is it ok to build my house on sloped footing? What does step footing look like? 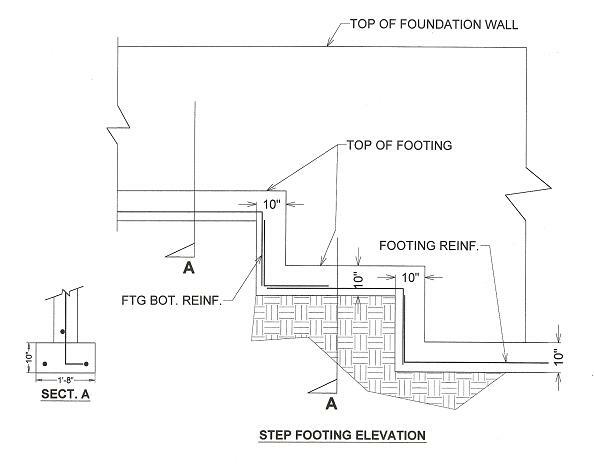 Step footing is one of the least understood details in residential construction. Below is a step footing detail. As shown both the concrete and reinforcements are continuous. By stepping the footing, it will minimize excavations - depending on your project, it can save a ton of money. The answer to your first question is no. Always make sure your footings are leveled. Ground movement in such events as earthquakes will cause unintended movements should the footings are not leveled. Some structural engineers require the vertical drop at step footings to be 2 feet max. This requirement is only enforced in commercial construction. I have seen residential structures dropped more than 10 feet going from basements to garages.